Viral videos of martial artists grappling with bodybuilders are nothing new. Every time it seems as though the internet has had i’s fill of this bizarre brand of spectacle, a new video surfaces, showing an ill-trained behemoth attempting to bulldoze a calm, collected grappling specialist, and usually getting tapped out. 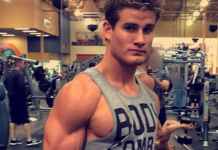 The latest instalment in the ceaseless procession of fighter vs. bodybuilder grappling videos features UFC lightweight Sage Northcutt and Irish bodybuilder Blessing Awodibu. The video begins with some extremely light sparring and rolling, as Northcutt appears to give his hulking adversary some tips. Toward the end of the video, the pair turn up the heat. From there, the showdown quickly hits the canvas, at which point Northcutt grabs a dominant position, and helps Awodibu to his feet for a typically chipper handshake. 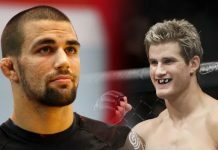 Sage Northcutt will next step into the cage on November 11, when he battles Michel Quiñones during the UFC’s return to Norfolk. This fight will mark the young star’s opportunity to bounce back from a tough loss to fellow Lookin’ for a Fight product Mickey Gall. Do you think Sage Northcutt will return to the win column when the Octagon touches down in Norfolk? Join the conversation in the comments section! This article first appeared on BJPenn.com on 10/23/2017.